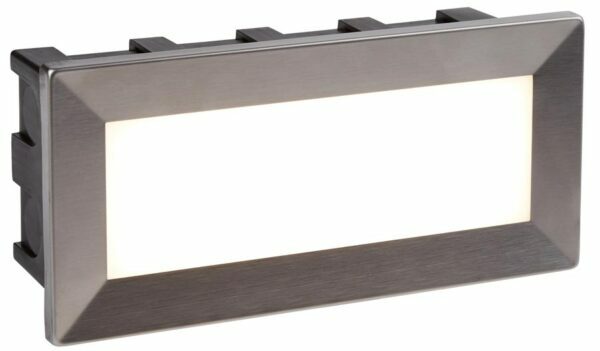 This Ankle 3.5w LED letterbox outdoor wall light in stainless steel with opal diffuser is rated IP65, charming, practical and and produces a downward source of brightness. The rectangular letterbox design makes it perfect for lighting garden pathways or steps. Fitted with 3.5w of cool white LED’s that give 163 lumens. Supplied by Searchlight who manufacture some of the best traditional and modern classic designs such as the Ankle 3.5w LED letterbox outdoor wall light in stainless steel with opal diffuser you see here. Does this light need a driver? This light has an integrated LED driver, so a separate driver is not required. Do these lights work on a pir sensor? We would advise checking with the manufacturer of your PIR sensor that it is suitable for LED low load switching, but in general, these lights are compatible with most PIR switches.